Snatched from an amazing collection of LED signage at Japanese design site PingMag, here are some pics and videos from the Harajuku UT Store. Uniqlo's hip boutique UT STORE in Harajuku features only limited-run t-shirts in capsules, with most (all?) priced at 1500 Yen. The store was designed by Kawashi Sato, and is quite a mesmerizing site to behold. 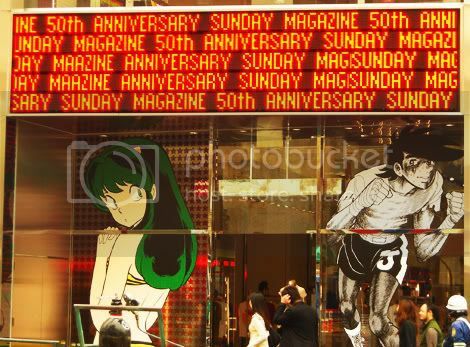 With the ongoing Shonen Sunday Magazine's 50th anniversary celebration at all Uniqlo shops (including the New York store), they've created a stylish front display using insane LED overload. New limited edition Shonen Sunday shirts are getting adding every week, and the latest feature Pro Golfer Saru and Kindaichi Shonen no Jikenbo. Click the link above to check them out.